I just got my grandfathers old 1010. I think it is a RU as the plate says 1010RU 54088. I believe it is a '64. I am a little confused because i thought the RU had 2 pto shafts. I have only one. Also i would like to know some specifics as to what coolant and oil to use. I plan on changing these as soon as possible as it has sat up for 7 years. I also would like to know what hydraulic fluid to use. It looks like i have a little bit of fluid leaking out the bottom of the pto shaft. If you guys have any other suggestions on what else i should check before putting this tractor to use i would like to hear them. It will probably be helpful to know that it is a gas model. Hey Clint, Based on your serial number your 1010 is a 1965. As for the RUS PTO 99% of them had only 1 power 540 rpm take off, The RU had two of them 540/1000 rpm. And for the coolant just use standard green 50/50 mix and for the motor oil I use 10W-30. For the hydraulic I use the Good stuff, HY-Guard from john Deere but its pricey, you might want to call your local shop and ask for a good aftermarket fluid or if you want I can check out a few brands that work well. 1965: 53722 yours is after so it’s a 1965, build just before they were discontinued. JD 1010 RU, Great site btw. Any recommendation on how to add or check the level of the hydro fluid? how hard would it be to replace the rear seal on the pto housing to keep it from leaking? Also what weight hydraulic fluid? The RUS was only spec'd for a 540 PTO. Apparently some got off the line with 540/1000 . The RU, as I understand it, had a removeable PTO shaft that you could put in the 540 or 1000 hole. I don't have my service manual with me to double check. +1 on the fluid recommendations. LOL thanks for the correct info skinny, Its people like you thats going to make this site a great place and yes you are correct about the removeable PTO shaft for the 540 & 1000 hole for the RU. I looked at the serial number plate again and there is a very slight impression of an S after the RU... This makes more sense now. Do you guys happen to know what oil filter i should get? All of the lettering has worn off of the one on there now. Now there is a STP brand that will fit but Autozone wants about $60 for it, but thats way too much for a filter so i use the WIX brand. It looks like fram has replaced the ph20 with ph20a. I will probably go with this one. I haven't done it yet but I hear replaceing the PTO seal is not that hard. You use some kind of hook to grab it and pull it out then slide, bump, nudge, hammer, or otherwise persuade the new seal back into the seat. My son had a tool fabricated that fits the diameter of the seal and slides around the shaft. This allows for force to be applied equally around the the seal as it slides in. If you haven't picked up a service manual I would recommend you do so. They are invaluable. I happened to get a photo copy of a gin-u-ine JD service manual. Friend of a friend deal. Here are reprints available from the same store. Thanks skinny, the manuals are on the way. I got the oil and filter changed. I changed the coolant, I couldnt find a plug on the radiator so i just pulled the plug on the right side of the block. It only took 2 gal to reach the neck of the radiator. I am going to run it tomorrow and see i can get some of the air out and add some more. I would really like to get the coolant temp gauge working but im not sure how to do that. It looks like there was an old one tapped in at the top of the t-stat housing but it must have broken off. It looks like there are two wires coming off of the gauge on the dash but they are not hooked up to any thing. Also there looks like maybe an oil sensor on the right side of the block but there is nothing connected to it. I will look at it more tomorrow when i get more daylight. jd 1010 ru, yes i am. I just want to make sure i got my bases covered on preventative maintenance before i start working her. It was my late grandfather's tractor and i just want to make sure it is taken care of. I found a few grease zerks and put some fresh grease in them. I am sure there are a lot more i just hit the ones that were most visible. i got the one under the front yolk or whatever you call it and a few on the 3pt hitch but there was one just behind the seat that wouldnt take any as well as the one just above the bush hog tire spindle. I will be more confident when i get a temp gauge set up. Ill just keep plugging away at the obvious until the manuals show up. Hey Clint, Yeah I know exactly how you feel. The 1010 RU that I have also came from my Late grandfather who left it to me after he passed away about 5 years ago. Ever since then I been slowly working and restoring it as best as I can. I had very little mechanical knowledge about tractors but over the years I have learned a lot from tinkering with the 1010, But could never find any good info about them so that’s why I started this site to share my info with everybody else. Thanks Richard, It was a good idea you had to start this forum. I use a forum for just about everything i own My truck, my boat, my car...haha and the list goes on. They are a great way to share information from personal experience. I am new to tractors but have a pretty extensive mechanical background. It took me about 10 hours to get it running after sitting for 7 years. The fuel would not even flow from the debris bowl. Then the carb was stopped up then no spark. haha so after a tune up kit(sand paper ) i got it started and on the trailer to bring it home. As it sits now the only wires i see that are still connected are to the starter. so i got a lot of wiring to figure out. It looks like it has been converted to negative ground and alt already. I have been watching your videos and they are a big help. What is up with the air cleaner? It looks like there is some oil in the bottom and i have never seen this before. Could some one maybe shed some light on this for me? Yeah that’s the oil bath air cleaner. Oil should be up the “Full” Line. Just use the same oil that you have in the crankcase. cool, yeah the oil looked good in there so i guess ill let it be for now. I just watched your fluid level check video. Does the transmission and hydraulic system and final drive all use the same oil? yes, all those systems take the same kind of oil. Already been down the wiring path. The only gremlin is the GEN light stays on all the time. I haven't had time to chase it down. Everything else seems to work fine. HEY! It's a sticky. That's my first sticky! I got the manuals in today, it says the hydraulic system uses 5w-20 and the transmission and final drives use SAE 80. I dont know if this is a misprint as it conflicts with your earlier post. I am not to worried about changing them immediately but some clarification would be useful. I tried to scrape the drive way yesterday and only made it one lap before it started skipping. Looks like i will have to pull the carb and dip it. I also ordered some points and a condensor and a dist. cap. on the gauges, it looks like i will need go get a new water temp gauge or at least the sending cable. The manual also explains the letters on the light switch. L = Bright front lights and white rear light on. B = Bright front lights and red rear light on. D = Dim front lights and read rear light on. The dash light comes on any time the switch is not in the OFF position. Hope this helps some of you guys. Hey Clint yeah my owner’s manual calls for the same specs that you listed but My local john Deere service center recommended Hy-guard which Is used in Transmissions, Final Drives & Hydraulic systems, but this is just what I use so I would say use what you are comfortable with. interesting... thanks for the clarification... I was just a little confused. Well the carb is soaking ill put it back together tomorrow and see how it goes. Thanks for the help. I bought a 1010 and wanted to change all the fluids in the tractor but after changing the transmission fluid with an oil that was supposed to be the same as the hyguard from John Deere. My operators manual said I needed to use a multi purpose 80 weight oil. 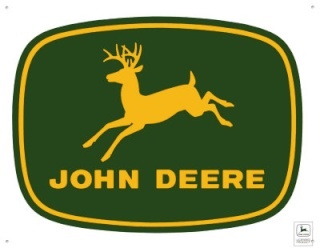 I called a local well known John Deere dealer. After talking to 2 different repair men I was able to talk to the repair supervisor. He said I needed to use 80 weight oil or 80w90 in the transmission and the use the hyguard in the hydrolic lift so now I will do this over. He said if I didn't the seals would start leaking. I am looking forward to warm weather so I can finish the restoration that was started before I bought it.